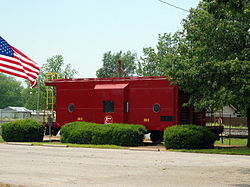 This historic Kansas City Southern Railway Caboose No. 383 pays homage to the importance of the railroad to Gravette's economy and history. 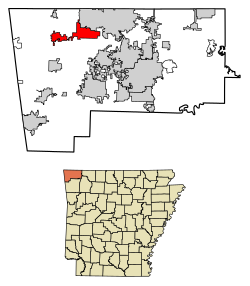 Location of Gravette in Benton County, Arkansas. Gravette is a city in Benton County, Arkansas, United States. The population was 2,325 at the 2010 census. It is part of the Fayetteville–Springdale–Rogers, AR-MO Metropolitan Statistical Area. Gravette is located in northwestern Benton County at 36°25′12″N 94°27′9″W﻿ / ﻿36.42000°N 94.45250°W﻿ / 36.42000; -94.45250 (36.419962, -94.452584). According to the United States Census Bureau, the city has a total area of 4.0 square miles (10.4 km2), all land. Gravette is situated approximately 105 miles (169 km) east of Tulsa, Oklahoma, 41 miles (66 km) northwest of Fayetteville, and approximately 60 miles south of Joplin, MO. Gravette annexed nearby unincorporated Hiwasse in 2012. The historic Kindley House was built in 1873 and added to the National Register of Historic Places (NRHP) in 1988. The original name of the first European-American settlement at this location was Nebo. The Nebo area is now referred to as Old Town in Chalk Valley and was the earliest pioneer settlement of the community. The settlement was platted in the 1870s by Joseph P. Covey, who relocated to Southwest City, Missouri, in 1881. Ellis Tillman Gravett opened the Chalk Valley Distillery in Nebo and was also the proprietor of a general merchandise store. In 1891, he moved that store west out of the valley to what is now downtown Gravette. Gravette was incorporated on January 27, 1899. By 1910 the population of Gravette amounted to 569. As of 2010 Gravette had a population of 2,325. The racial and ethnic composition of the population was 87.8% non-Hispanic white, 0.6% black or African American, 3.5% Native American, 0.7% Asian, 4.1% from two or more races and 4.0% Hispanic or Latino. As of the census of 2000, there were 1,810 people, 697 households, and 471 families residing in the city. The population density was 775.1 people per square mile (298.7/km²). There were 773 housing units at an average density of 331.0 per square mile (127.5/km²). The racial makeup of the city was 92.87% White, 0.17% Black or African American, 2.10% Native American, 0.61% Asian, 1.05% from other races, and 3.20% from two or more races. 2.93% of the population were Hispanic or Latino of any race. There were 697 households out of which 37.2% had children under the age of 18 living with them, 49.5% were married couples living together, 14.5% had a female householder with no husband present, and 32.4% were non-families. 28.3% of all households were made up of individuals and 16.2% had someone living alone who was 65 years of age or older. The average household size was 2.48 and the average family size was 3.07. In the city, the population was spread out with 29.2% under the age of 18, 8.3% from 18 to 24, 27.0% from 25 to 44, 18.0% from 45 to 64, and 17.6% who were 65 years of age or older. The median age was 36 years. For every 100 females, there were 87.0 males. For every 100 females age 18 and over, there were 82.9 males. The median income for a household in the city was $29,881, and the median income for a family was $34,844. Males had a median income of $28,571 versus $18,906 for females. The per capita income for the city was $15,241. About 11.5% of families and 16.6% of the population were below the poverty line, including 22.5% of those under age 18 and 19.3% of those age 65 or over. Bentonville School District, which leads to graduation from Bentonville High School. The climate in this area is characterized by hot, humid summers and generally mild to cool winters. According to the Köppen Climate Classification system, Gravette has a humid subtropical climate, abbreviated "Cfa" on climate maps. 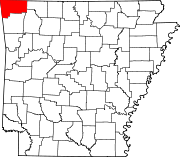 Gravette is the site of the coldest recorded temperature in Arkansas: -29 °F on February 13, 1905. 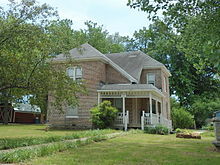 Wikimedia Commons has media related to Gravette, Arkansas. ^ a b "Geographic Identifiers: 2010 Demographic Profile Data (G001): Gravette city, Arkansas". U.S. Census Bureau, American Factfinder. Retrieved September 23, 2013. ^ Enloe. "State Climate Extremes Committee (SCEC) | Extremes | National Centers for Environmental Information (NCEI)". www.ncdc.noaa.gov. Retrieved 2017-12-31. ^ "The Snowiest Place in Each State". Retrieved 2015-01-24. This page was last edited on 22 August 2018, at 18:08 (UTC).